This section is to make known any prayer opportunities that would help to bring people together across the churches. Please use the contacts page to let us know of prayer events being hosted by your church. A group called Ewell Ecumenical Ladies (EELS) are meeting on Wednesdays in term time 10.30-12.30 (in peoples’ homes). For more information, contact Pam Eade (020 8393 6886). The Churches Together in Ewell prayer week this year is from 3-7 June 2019. There will be opportunities during the week to pray together and to sign up to pray for an hour, with prayer guidelines provided. 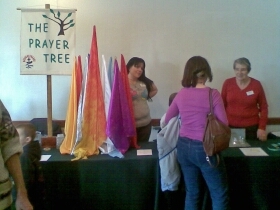 The Prayer Tree Project invites people to connect with God in prayer and offers to pray for them in Jesus' name. A small group drawn from several CTE member churches take this project to visit various community events over the summer period and is always encouraged by the responses it receives during its various "outings". 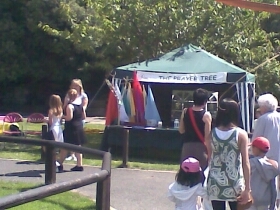 The idea of the Prayer Tree is simply to invite people (of faith or "none") to consider connecting with God in prayer - with the promise that local Ewell Churches will offer up any written prayer requests submitted to the team in their services in the following week or so. Do get in touch if you would like to know more or are organising an event at which you would like an interchurch prayer team present. More information is also available on the Hope-Epsom and Ewell & Prayer Tree facebook page.